I want to controll mosquitos nats ants bees and all other bugs around and in my house on mn. 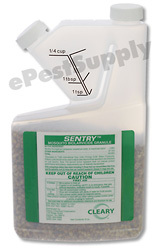 Sentry is a mosquito larvacide that is applied to standing water areas to prevent mosquito development. It contains a bio larvacide known as Bacillus Thuriengensis. This is basically a bacteria that kills the mosquitoes and their eggs and prevents development in these areas. For control of adult mosquitoes, you will need to use a contact insecticide such as Talstar or Onslaught FastCap. These products are best applied through a backpack mister such as the Solo 451. Hope this helps.